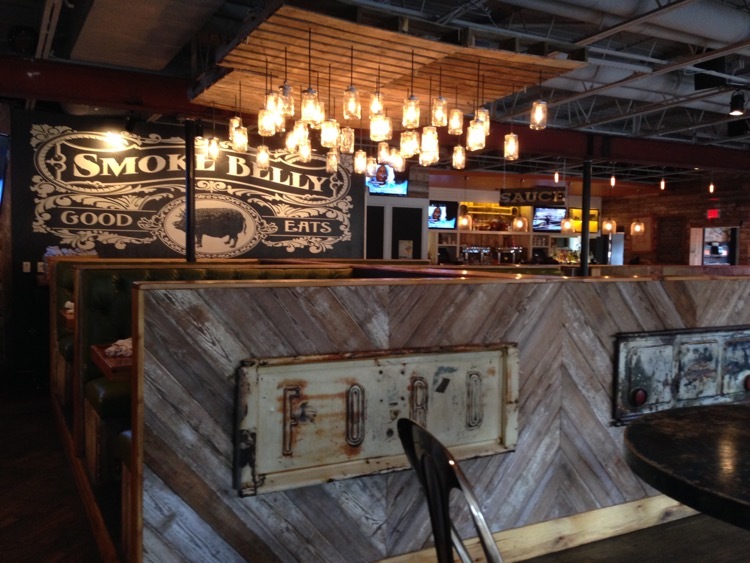 Earlier this week, a lunch for two deal appeared on Travelzoo for Smokebelly BBQ, in Buckhead. I don’t know that I had heard much about the place, but the deal seemed to be a value (two plates, an appetizer and two non-alcoholic drinks for $29). Always interested in a deal, particularly when it involves barbecue, I clicked on “purchase” and set it aside for a later date. 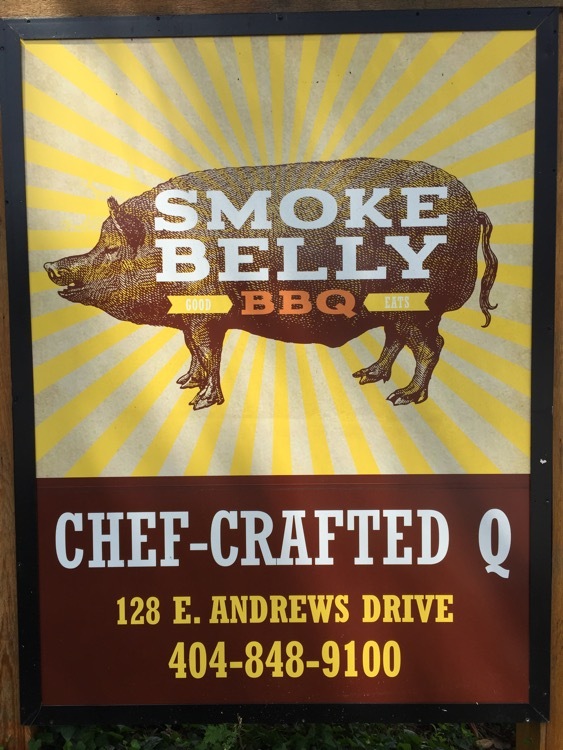 This afternoon, we headed into Buckhead for some shopping and, armed with this deal, some barbecue. sweet, savory and Carolina gold, which were in glass bottles that were all cold and sweaty, as if they had spent the night in the fridge. I was underwhelmed by all three. 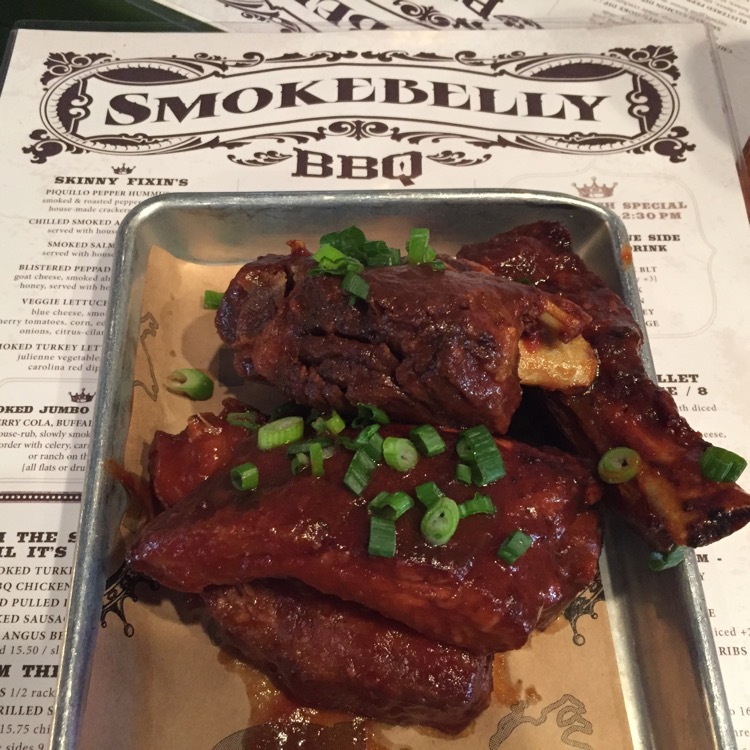 For a starter, we queried the server and decided on an order of their cherry cola ribs. The ribs are flash fried, then covered in their cherry cola sauce. Unfortunately, they just didn’t have much taste. It’s rare for me to leave meat on a bone on a rib plate, but this time I left at least one completely untouched rib. 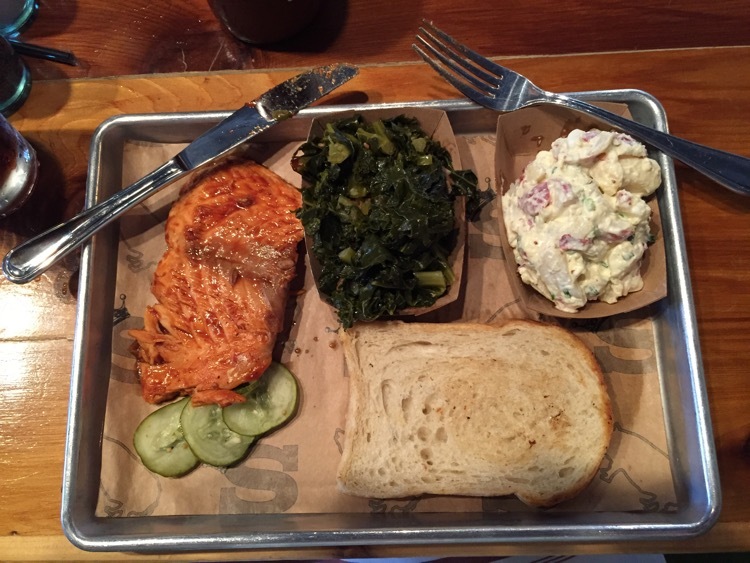 My beloved ordered the salmon plate, with smoky kale and potato salad. She asked about the cole slaw, but it was creamy and mustard based – a double no-no for her. I chose a combo plate with brisket and sausage, with a side of house waffle fries and Brunswick stew. The brisket was very tender, but like everything else had very little flavor. If this is “chef-crafted cue”, the chef has never crafted cue before this place. In my opinion, if this place succeeds, it will be because of the bar and not the “cue”. Thanks for the confirmation on Dickey’s. 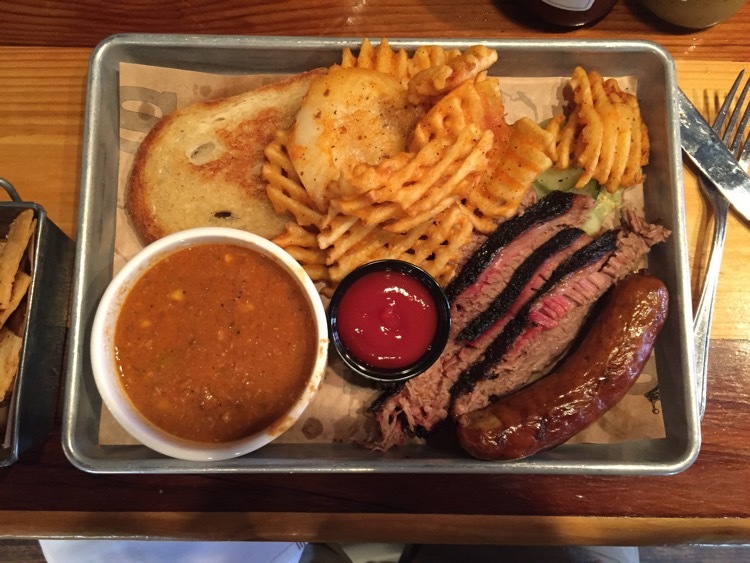 Pecan Lodge is on the list. We’re driving through later this summer and if we hit Dallas on the right day of the week it will be checked off. 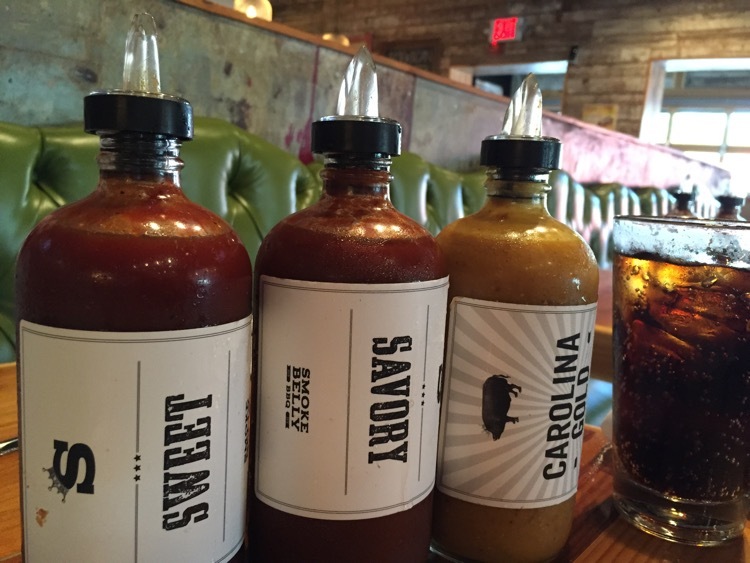 Like lots of BBQ joints outside Texas, it sounds like these guys spent way to much time making fancy sauce options and not nearly enough time smoking their meat! I don’t think they spent that much time on the sauces. And, sadly, I’ve had tasteless barbecued beef in the Republic of Texas. Y’all are to blame for Dickey’s Barbecue Pit, aren’t you?